‘No shoes inside’ was the first phrase I read on the sliding glass door of Meander Taipei Hostel. But upon entering the lobby, instead of taking my footwear off, I was stunned by the sprawling lobby of the hostel. Three long tables, except for the one in the dining area, dominate the ground floor of the building. Almost-floor-to-ceiling windows make the entire floor bright, perfect for meeting other travelers. 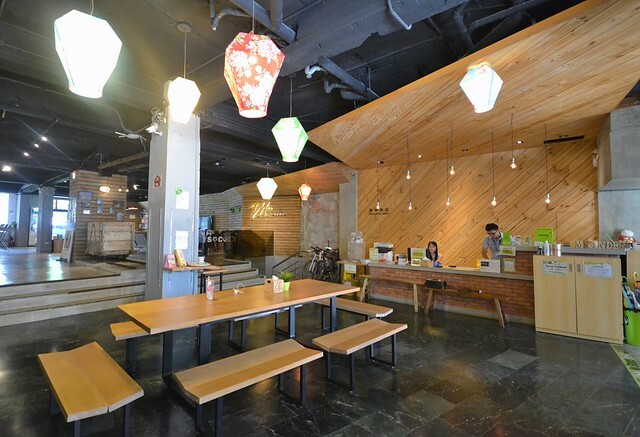 Sprawling lobby of Meander Taipei Hostel. Slippers are provided but I was allowed to use my own flip-flops. The front-desk was created with lower desks and wooden chairs. 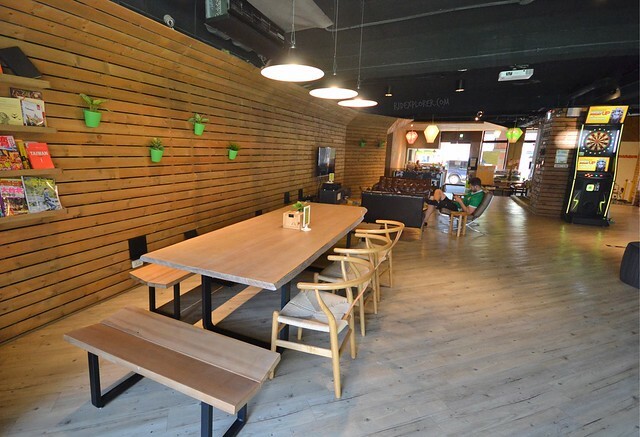 In this way, guests can converse with the hostel staff just like lounging on the cozy common areas. After scanning their list for my reservation, I was immediately invited for a short tour on the lobby. 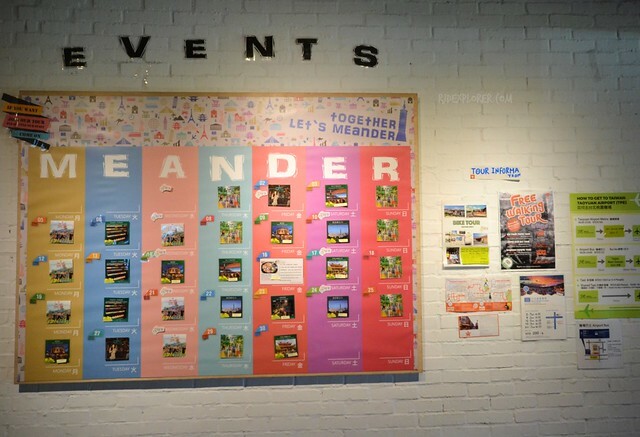 Meander Taipei Hostel, apart from offering a topnotch backpacker accommodation, hosts events for their guests. These activities are available on a calendar of events that include but not limited to old town tour, chill out tour, temple tour, and even picnics. 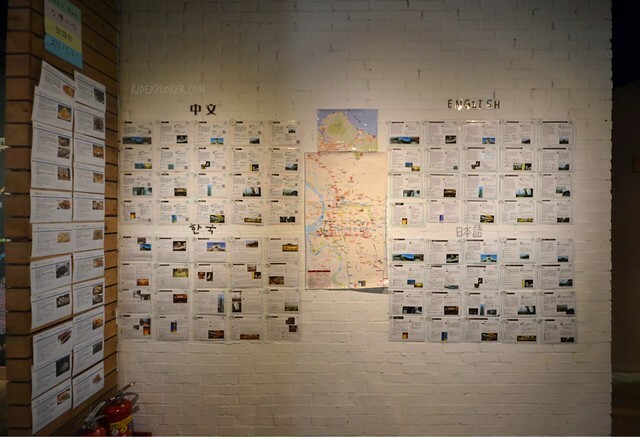 The other side of the wall maps out the destinations to visit in Taipei and Taiwan, both in English and Chinese languages. Of course, food must-tries are enumerated on another side. The in-house tour continued passing by the dining area to the laundry area. House rules were also cited at times before the hostel crew accompanied me to my dorm room. The access to the guestrooms is through the entrance on the side of the front office. Going to the room at first is a bit tricky but you’ll get used to it after quite a while. You can’t avoid rain when in Taiwan but the hostel lends umbrellas so you can still go out and explore. I was assigned to a 4-mixed dorm room on my first night and it was great to find out that the room has an en-suite toilet and bath. Layout of the room is also maximized by putting the bunks on one side, creating more space to move. Lockers that can accommodate a regular-sized backpack can be accessed on the rear part of the room. Each bed has a comfy and soft mattress and a pillow, with blanket, bunks lights, own power outlet for any kind of plug, and a USB port. Hooks for clothes are also available inside the bunk which is not that common to hostels. If unfortunately you were assigned on an upper bunk, don’t worry because the ladder is installed having a slope so you won’t have a hard time climbing to your bed. Bath essentials like bath soap, shower gel, and shampoo are provided though I’d love if the toilet has a bidet. On my second night at the hostel, after arriving from a tiresome trip to the northern part of Taiwan to visit Bitoujiao and Shifen, I moved into a double room. Of course, bed is expectedly larger than those in the dorm rooms and blanket is softer, I suppose. Another luxury is the two fluffy pillows, a flat-screen television, an air-conditioning unit you can set on your own, and an ample space to lounge. Free bottles of mineral water are also provided but the management asks everyone to just refill it on the lobby to reduce plastic waste. 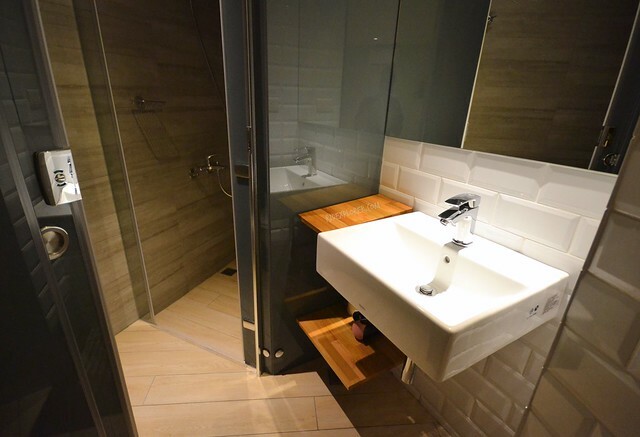 En-suite toilet and bathroom for the double room. 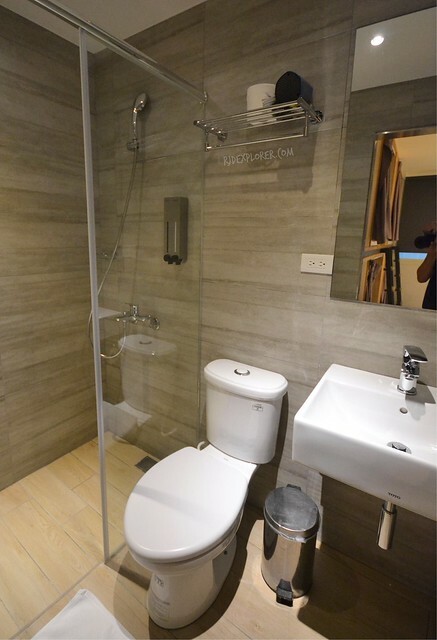 For the bathroom, the sink is separated from the toilet and shower so it can be used simultaneously if you have a companion. 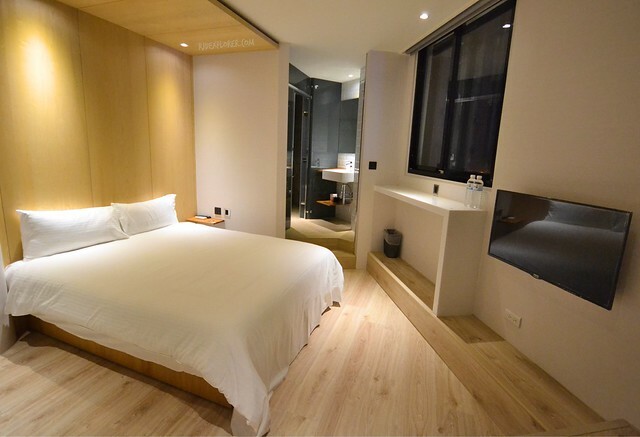 Similar to the dorm’s toilet and shower facilities, it offers hot and cold shower, shower essentials, and hairdryer. The only problem I have with the room is that it’s too cozy that you will tend to lock yourself inside all throughout your stay that will hinder you to bond with other travelers on the common lounge. 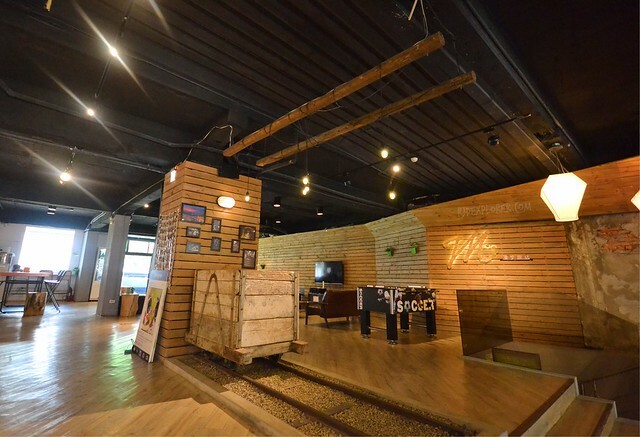 Meander Taipei Hostel really planned the room layouts in such a way that it will provide more space for their guests. I observed it both on the dorm and double rooms. 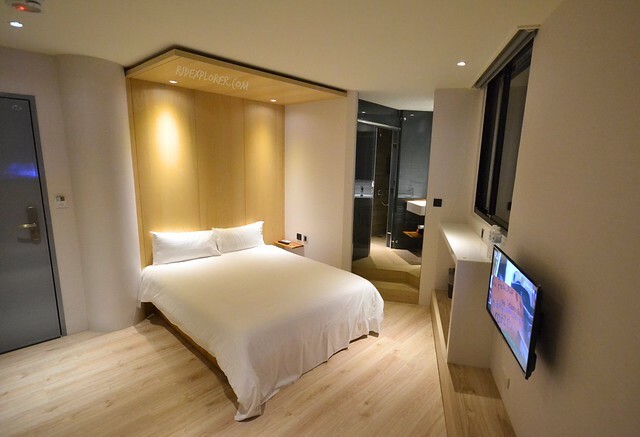 Guests can actually appreciate it because the rooms are not crowded even if you’re sharing it with several people. 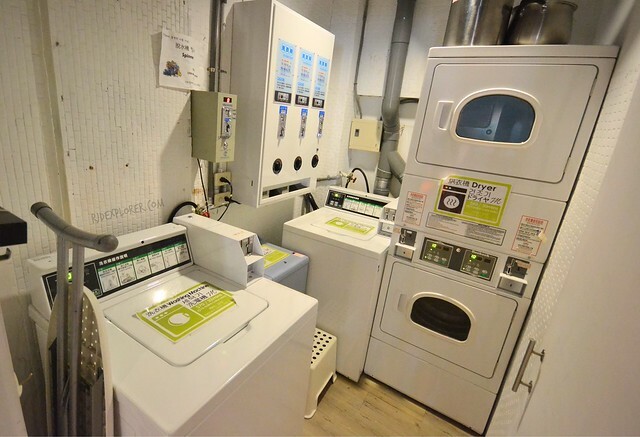 Laundry facilities of Meander Taipei Hostel. Starting at eight, the dining table is filled with bread, pastry puffs, spreads such as chocolate, jam, and peanut butter. This light meal also includes fruits like watermelon, guava, or pineapple, and a hot congee. For beverage, it’s surprising to see varieties of coffee packets like caramel macchiato, milk tea, cappuccino, and black. Toasters, microwaves, and water dispensers are available on another table. Please do note that you need to wash all your dishes after every use. Breakfast starts at eight in the morning. Location wise, the hostel is not that near to an MRT station. But walking for about five minutes, passing some food and milk tea (which is super cheap!) stalls, can bring you to Ximen Station. If I make my way back to Taipei again, Meander Taipei Hostel is definitely on top of my list for a place to stay and meet people. 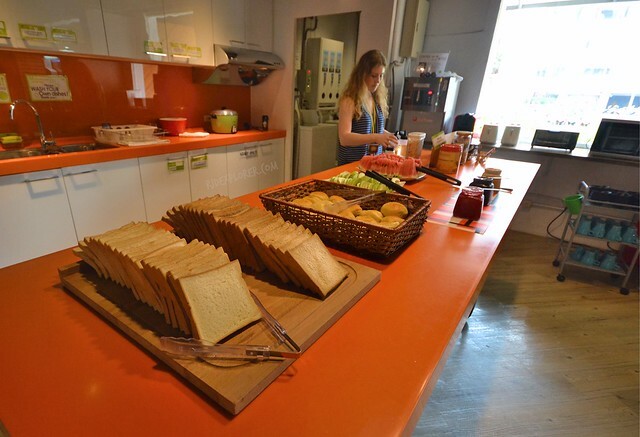 Facilities and amenities are excellent quality and the events the hostel hosts for their guests allow everyone to meet likeminded travelers that anytime soon will turn into new set of friends. Disclosure: Thanks to Meander Taipei Hostel for accommodating me during my stay in Taipei. All opinions stated in this post are my own. Hello! I chanced upon your blog because I wanted to know more about the hostel. In which floor in the building is the hostel, or its rooms are located? I’m leaving in a week and would like to finalize my reservation. Thanks very much! They’re occupying the entire building, I think.